Swedish doom trio Domkraft return with their sophomore full-length Flood, offering a journey into the plummeting depths of classic doom metal, with just a tinge of fuzzy psychedelia. There is no beating around the bush: Domkraft are a band that stick to the sound of traditional (psychedelic) doom metal; the music and song-structure are something we have heard from countless bands over the last few decades. What we have not come across recently is the sheer dedication Domkraft bring into their music. This, when coupled with the skilled musicianship seen on their second full-length Flood, results in a hypnotizing immersive experience unlike any other. There is a clear ‘no nonsense’ approach to Domkraft that truly pays off on Flood. Right off the bat, “Landslide” paints a clear picture of what’s in store for the rest of the record. Nearly ten minutes in length (the longest runtime on the album), it builds upon the patterned drumming of Anders Dahlgren, as the repetitive riffs by guitarist Martin Widholm dial up the psychedelia. The band have clearly payed close attention to their song structure, with a soothing interlude midway that allows the latter half with its heavier riffs to feel even more powerful, sounding almost like a much rawer and sludgier relative of Monolord. 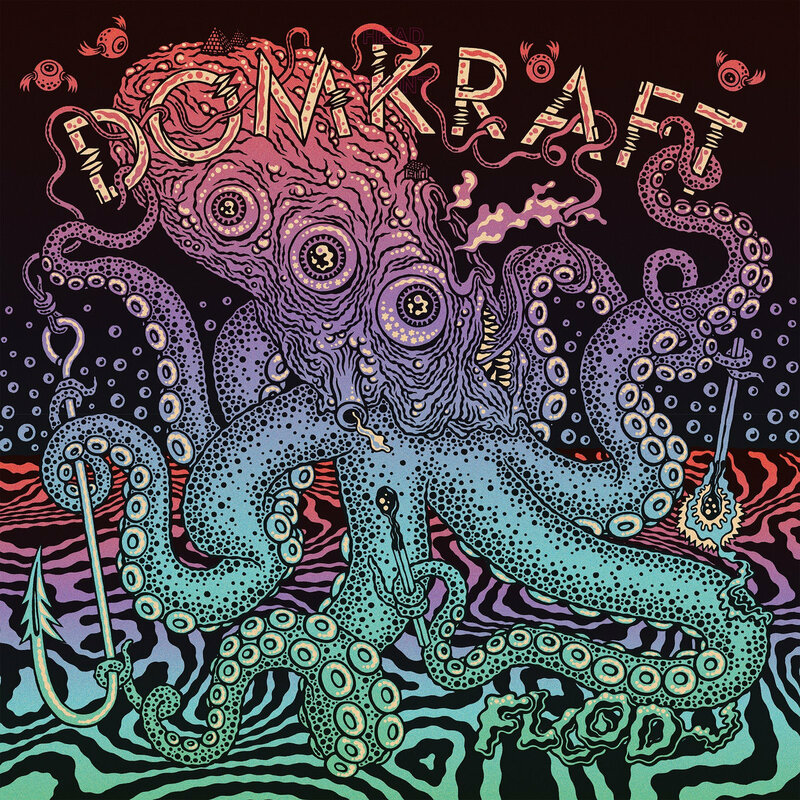 The trio in Domkraft clearly had a clear image of what they wished to convey with Flood, as the album does come across as one monolithic entity. Across the seven tracks on the album, the music maintains a steady flow from one part to another. At the same time, each individual track maintains its own flavor, feeling like a well-rounded individual unit. A prime example is “Watchers”, which almost feels like the continuation of the guitar riffs on “Landslide”, but quickly reorients itself into a completely different direction. Those unaware might be surprised to find that the band hails from Gothenburg in Sweden (a place with its own history with respect to doom metal), because their sound clearly has much more in common with their American counterparts when compared to their European peers. Vocalist (and bassist) Martin Wegeland delivers a strong performance, channelling the same scream-and-shout style usually heard in acts such as Yob and Inter Arma. Title track “Flood” even manages to bring in a tiny (but extremely engaging) bit of Neurosis-esque post-metal industrial base to the sound, whereas the overlaying psychedelia found all across Flood is reminiscent of the works of Kylesa and Elder, minus the progressive flair. One question that arises is, what makes Domkraft stand out despite them sticking to the tropes of a truly tried-and-tested genre? The first answer would be found in the mature songwriting on display. However, the skilled musicianship only stands out thanks to the excellent production value. This is actually a key area of improvement on their previous album, The End of Electricity, in terms of sound. The bass lines are just as audible as the heaviest distorted guitar riffs, making the music feel dense yet much more natural. “Octopus” is a good testament to this fact: enveloped by two much longer tracks, “Sandwalker” and album closer “Dead Eyes, Red Skies”, it quickly engages the listener with the equally audible rolling guitar grooves and rhythmic bass lines. As mentioned at the start, there are no surprises in store for you with Flood. Domkraft walk through all the tropes of classic doom metal – heavy distorted guitar riffs, plenty of feedback, long, drawn-out repetitive drum patterns, and every other element that comes to one’s mind when they think of the genre. The things is, they do it with such a high regard to the quality that it makes Flood sound extremely fresh, and ultimately an exciting record to listen to. Next PostMegaton Leviathan - "Mage"